Arcam has finally bitten the bullet by introducing an upgraded DVD player which is as near to being universal as the company has designed. First and foremost the DV137 is a DVD player, and in common with all such players it is also capable of playing CDs, but, in this case, to a standard that is comparable to an audiophile grade disc spinner. It's also a full-on multichannel DVD-Audio player, but unlike its predecessors that come from this stable, this is the first previously united in supporting DVD-A to the exclusion of SACD. 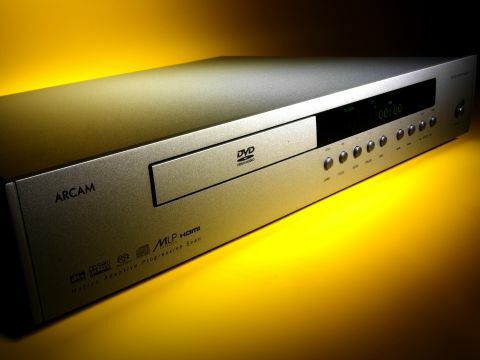 When the Arcam DV137 was first demonstrated to us it was capable of full multichannel SACD replay, but this lasted just as long as it took to realise that there were severe distortion problems with the deck. If this problem can be resolved, a firmware update will be issued and owners of DV137s will be able to get the feature back. But for the moment the company is not making any promises. This is a shame as multichannel SACDs are much more widely available than the DVD-A equivalent. Because Arcam designs its own DVD players from the ground up, it has an unusual freedom to choose who it wants as its technology partners. For this model, Arcam has continued to maintain its association with Zoran, and this product is the launch vehicle for the Zoran Vaddis 888S processor, which handles all the format compatibility processing. It is coupled here with broadcast quality 11-bit 216MHz video DACs from Analogue Devices. One of the main talking points will be the high- performance Anchor Bay ABT1010 10-bit video upscaler, which takes the 480p or 576p output from disc, and outputs a 720p, 768p or 1080i/p signal across the HDMI link (along with high-resolution multichannel audio). The native resolution for many LCD panel displays is 768p (1366 x 768 pixels progressive). Using HDMI, the player will auto- negotiate the best available common settings with the chosen display. In addition, Arcam's Mask of Silence EMC damping technology reduces internally radiated electrical noise that would otherwise mask fine detail. Other improvements include a colour OSD menu system with setup calibration wizard, and a new more ergonomically sound remote control. The player can deliver stereo audio and composite or RGB video at the same time as multichannel audio and HDMI digital video, useful say, for playing into a second room. There are a number of other features aimed at making the player suitable for multiroom systems such as its ability to be used with AMX or Crestron controllers. It is also well endowed with secondary features, such as powerful speaker and bass management, adjustable lip sync and an enhanced buffer memory to eliminate the gap when changing layers on disc. The Arcam delivers an impressive performance on screen. The picture it generates is stable down to the last pixel when it is examined closely on a big screen. Edges are crisp too, but there's no pretence of HD standard resolving power - you won't see every last blade of grass on a lawn, which is the subject of one particularly telling screen on one standard test disc used in this review. Sharpness is reduced to the level that stops just short of highlighting unwelcome MPEG artefacts, specifically including chroma upsampling error (CUE) according to Arcam, so everything appears to flow naturally and organically. Motion artefacts are also extremely well handled on the whole, though scrolling backgrounds (or foreground objects moving against a fixed background) did look jerky at times. Staircasing of diagonal lines was noticeable by its absence, and there is little sign of the usual muddying of detail in moving areas. For the most part, noise was not an issue. Despite the occasional appearance of MPEG artefacts, which to a large extent are inevitable, the player is notable on the whole for the consistency and solidity with which it treats the recorded signal. Colour transitions are handled cleanly, and difficult material - the subtle colour transitions you find in cloud scenes for example, or lapping water - are found to be reproduced particularly well. Shadow detail found near the black end of the spectrum is certainly handled at least as well as my resident Yamaha HD ready DLP projector (the DPX-1300) was able to resolve them. The sound quality story is no less impressive. Serious music listeners often use separate players for CD because DVD players fail to perform well with audio discs, perhaps a side effect of their internal complexity, high level of jitter (a universal player like this usually has a number of clocks, which can mutually interfere) and the amount of EMC that is floating around internally. In this case, the player sounds firm and stable, with driving, propulsive rhythms, and an unusually solid feel, even with SACD which can often be a little soft centred when it is played through some of the lesser universal players. Overall, the DV-137 is a superior DVD player, albeit one that is a work in progress when it comes to the playing back of multichannel SACD. Consider this if this is important to you and your disc collection. Keep checking with Arcam about this issue, which may have been settled one way or another by the time this is published. As a CD and DVD-Audio player, the DV137 is difficult to criticise, and as a DVD player it is a high achiever. It is only convincingly beaten in my experience by a handful of much more expensive models that have exotic image processing from the likes of companies such as Silicon Optix.